After a good night sleep last night I am feeling refreshed and no longer have that jet lag feeling. 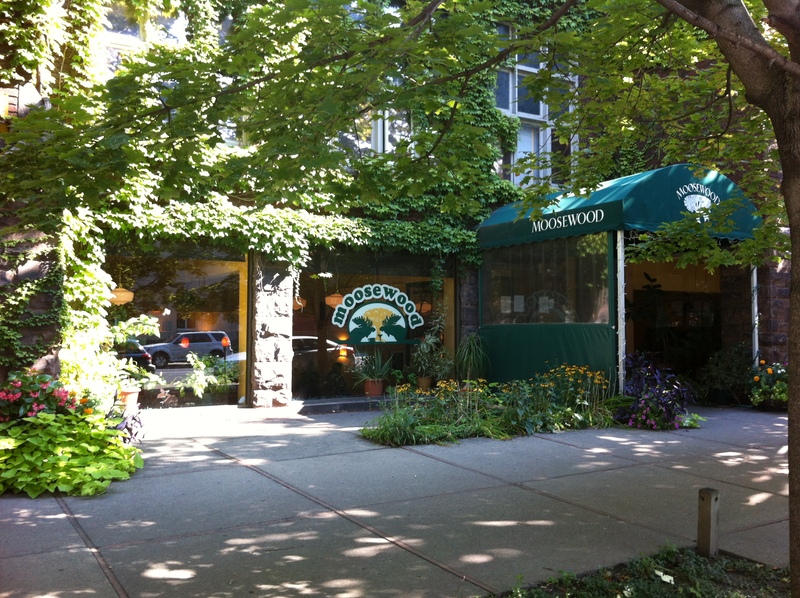 This morning I head off to find Moosewood Restaurant and it is just around the corner from where we had dinner the night before. It is located in what used to be a school. The hallways in the bottom floor of this old school have been turned into a “mall”. It’s a very quirky setting and matches each of the stores within it. With a large bookshop selling out of print and rare books (of only I had more time to browse), craft shop, grocery store and a cafe (as well as Moosewood). On the walk to Moosewood I passed a cafe called “gimme coffee”. In desperate need for coffee, I go there on the way back. America isn’t know for good coffee but if you find somewhere that promotes fair trade, organic, recycling etc my experience is that they will also usually have good coffee as well. And this one does too. Yay! The drive to NYC is lovely compared to the rest of the drive. Little town of lisle looks like a great place to stop. This country is so quirky. No place is the same- except the boring shopping outlets. After what seems to be an eternity to get to our drop off spot, we take a taxi ferry from Liberty Park, New Jersy to Battery Park, Manahattan NYC to try and find the subway to our respective homes for the evening. After walking a few blocks and feeling very sweaty and horrible, I decide on a taxi. What a ride – loved it! The way the taxi driver weaved through traffic what seemed to me to be a two-lane road ended up being a free for all squeeze between anyway you can, which was four aside at times. Arrived at hotel and after booking in, I grab a take away coffee and glass of red to take up with me to my room to enjoy while I refresh ready to go out for a late dinner. For dinner I consider either going to the 7 Eleven, Eataly (no spelling error) or back to Shake Shack in Madison Square Gardens park. I decide on Shake Shack. It is a warm night and park setting with a burger and glass of red is perfect. The queue reduces relatively quickly and within half hour I am eating my dinner (10.30pm). I’m going to take it easy tomorrow, if that’s possible in New York.